Ondansetron sublingual tablets using various super disintegrants such as starch citrate, sodium starch glycolate, and croscarmellose sodium were prepared in this research work. For the first time, Starch citrate was tried as a super disintegrant. The formulation characteristics and various parameters of starch citrate based formulas were compared with other formulas to evaluate this profile as the super disintegrant. The study is focused on the rapid disintegration of the tablet in the oral cavity and masking the bitter taste of Ondansetron. Since Ondansetron bioavailability was 60% due to the first pass metabolism and it is suitable to convert it into the sublingual tablets which provide better bioavailability. The ingredients such as microcrystalline cellulose, mannitol, lactose, magnesium stearate and talc were also incorporated in the formulation design. The tablets were analysed for various quality control parameters and in vitro dissolution profile. The best formulation was subjected to stability studies and compared with marketed formulations. The drug release kinetics of formulation were studied by using the various pharmacokinetic models such as Zero Order, First order, Higuchi and Korsmeyer-Peppas kinetics. Starch citrate, FTIR, DSC, Sublingual delivery, Drug release profile. The formulations with rapid onset of action are most suitable for the treatment of acute conditions. It can be achieved by a parenteral route of administration, but it may not always be suitable always. So other rapid action, dosage forms are the next platform for this purpose, such as the routes by which drug is immediately absorbed into the systemic circulation. There has been a lot of interest in exploring the oral cavity as a potential for delivering drugs into the systemic circulation directly [1,2]. The sublingual route usually produces a faster onset of action than orally ingested tablets and the portion absorbed through the sublingual blood vessels bypasses the hepatic first-pass metabolic processes. The Sublingual route can be considered as an alternative route of administration due to the ease of usage, patient compliance and improved bioavailability. Thus, these formulations are particularly beneficial to paediatric and geriatric patients. In addition, sublingual mucosa an abundance of blood supply in the sublingual region allows excellent drug penetration to achieve high plasma drug concentration with rapid onset of an action. However, in order to achieve optimal Oro mucosal delivery, properties of the active compound and other properties of the formulation are also important. The drug should be soluble, stable and able to easily permeate the mucosal barrier at the administration site. Another important factor is the dissolution of the dosage form. If the dissolution of the drug is slow or incomplete, contact time is short, or permeation is very low, a large part of the dose will not be able to get absorbed through the oral mucosa and will be swallowed, consequently affecting the bioavailability to a large extent. The main prerequisites for rapid dissolution of a drug include a large effective surface area and the lack of thick, stagnant hydrodynamic boundary layers around the drug particles that hinder drug dissolution by slowing diffusional transport [3,4]. A drug candidate, which is being administered through a sublingual route is expected to have some characteristics such as palatability and no nauseousness. The dose less than 20 mg, less molecular weight, stable in saliva and water and most significantly unionization or partial ionization in oral pH conditions are a prerequisite. The physicochemical properties such as solubility, crystal morphology, particle size, hygroscopicity, compressibility and bulk density of the drug potentially affect the performance of sublingual dosage forms such as tablets and films. Ondansetron undergoes the extensive first pass metabolism offers a more scope for converting the drug into the sublingual dosage form for better therapeutic effect and quicker onset of action . Ondansetron is a serotonin 5-HT3 receptor antagonist used mainly as an antiemetic following chemotherapy most often. The effects of Ondansetron thought to be on both peripheral and central nerves. Ondansetron reduces the activity of the vagus nerve, which deactivates the vomiting centre in the medulla oblongata and also blocks serotonin receptors in the chemoreceptor trigger zone (CTZ). It has little effect on vomiting caused by motion sickness and does not have any effect on dopamine receptors or muscarinic receptors. The oral administration of ondansetron is passive and completely absorbed from the gastrointestinal tract and undergoes first pass metabolism . Peak plasma concentrations are attained approximately 1.5 hours. For the doses above 8 mg, the increase in Ondansetron systemic exposure with dose is greater than proportional this may reflect some reduction in first pass metabolism at higher oral doses. Bioavailability is slightly enhanced by the presence of food but unaffected by antacids. The disposition of Ondansetron following oral, intramuscular or intravenous dosing in adults is similar with a terminal elimination halflife of about 3 hours and steady-state volume of distribution of about 140 L. Ondansetron is not highly protein bound (70-76%). Ondansetron is cleared from the systemic circulation predominantly by hepatic metabolism through multiple enzymatic pathways. Less than 5% of the absorbed dose is excreted unchanged in the urine. The absence of the enzyme CYP2D6 has no effect on ondansetron's pharmacokinetics. The pharmacokinetic properties of Ondansetron are unchanged on repeated dosing . In the present study ondansetron, sublingual tablets were prepared competitively against the marketed formulation. The available dosage forms in the market demonstrated the varying disintegration time and upon the shelf life, it further increased and it may affect the onset of action which is essential for the drug such as ondansetron. Since as an effort to overcome the current lapses in the marketed formulations the research work was carried out with different super disintegrants such as sodium starch glycolate, croscarmellose sodium and starch citrate. Starch citrate is selected as super disintegrant due to its potential against regular super disintegrants. The super disintegrants were incorporated in the formulation design as alone and in varying combinations. Formulation design is compared to the performance of the starch citrate with the other available super disintegrants. The formulation design and development includes the Preformulation study, drug excipients interaction study by using FTIR and DSC, formulation development, in vitro study and analysis of release mechanism. The final optimized formulation was subjected to stability studies. In the tablet dosage form the drug is in intimate contact with one or more excipients, the later could affect the stability of the drug. Knowledge of drug-excipients interactions is therefore very useful to the formulator in selecting appropriate excipients. The compatibility study between the drugs and used excipients were mixed and studied by the method such as FTIR and DSC. Thermal analysis of ondansetron drug with a mixture of various ingredients was studied by various thermal analysis of the DSC Seiko, Japan. DSC 200c model. Samples of 1-4 mg were sealed hermetically in flat-bottomed aluminum cells or pans. Then the samples were heated over a temperature of 30-450°C in an atmosphere of nitrogen (30 ml/min) at a constant rate of 10°C per minute using alumina (standard material of DSC supplied by Shimadzu Corporation) as reference [8,9]. Sublingual tablets were prepared by direct compression technique. The formulation design of the different formulations was presented in Table 1. Before the ingredients were mixed for the compression all the ingredients were passed through a 60 mesh number sieve. Then all the ingredients were mixed thoroughly for at least 15 minutes and passed through the 44 number mesh sieve. The mixture was then lubricated by using Magnesium Stearate and Talc in the poly bag. Then the mixture was compressed in tablet compression machine by using 7 mm punches. Table 1: Formulation design of ondansetron sublingual tablets. The formulated tablets were evaluated for its general appearance and observations were made for shape, colour and texture. The formulated tablets were subjected to in process quality control parameters such as Hardness test weight variation, friability test. Two tablets equivalent to 8 mg of the drug were powdered and dissolved in 20 ml of methanol. This solution was filtered through 0.45 μm Whatman filter paper, and then the resultant filtrate volume was made up to 50 ml with 6.8 pH phosphate buffer in a volumetric flask. From the above solution, 5 ml was taken and diluted up to 50 ml with 6.8 pH phosphate buffer, the absorbance of the resulting solution was analysed by UV Spectrophotometer at 248 nm. The prepared sublingual tablets were studied for the in vitro profile in 6.8 pH phosphate buffer. The release of Ondansetron from the tablets was studied by using USP XXIII paddle type apparatus. The drug release profile was carried out in 900 ml of freshly prepared 6.8 pH Phosphate buffer maintained at 37 ± 0.5°C as a medium and rotating the paddles at 75 rpm. Samples were withdrawn at 2 minutes interval for up to 10 minutes. After 10 minutes, samples were withdrawn in 5 minutes interval for up to 60 minutes. At each sampling interval, 5 ml of the sample was withdrawn and replenished by an equal volume of the buffer solution. The samples were filtered through Whatman filter paper and analysed after appropriate dilution by using UV spectrophotometer. The absorbance of the sample solution was measured at the maximum wavelength of 248 nm. The in vitro dissolution profile of all the formulations was fitted to famous pharmacokinetic models such as Zero Order, First Order, Higuchi and Korsmeyer-Peppas, to ascertain the kinetic modelling of drug release. Correlation coefficient (R2) values were calculated for linear curves obtained by the regression analysis of the kinetic plot. The following plots were made for each kinetic model. Zero-order kinetic model-Cumulative % drug released Vs time. First-order kinetic model-log cumulative % drug remaining Vs time Higuchi model-Cumulative % drug released Vs square root of time. Korsmeyer-Peppas model-log cumulative % drug released Vs log time. Mechanism of drug release was analysed as per Korsmeyer-Peppas equation [10,11]. ICH specified the length of study and storage conditions: Long term testing 25°C ± 2°C/60% RH ± 5% for 12 months Accelerated testing 40°C ± 2C/75% RH ± 5% for 6 months. In the present study, stability studies were carried out at for a specific time period up to the 3 months for selected formulation at room temperature. The tablets were evaluated for assay, Mouth disintegrating time, wetting time after three months. Ondansetron hydrochloride, is a potential 5 HT3 antagonist antiemetic with the oral bioavailability of 60% caused by hepatic first pass metabolism. The half-life of the drug is 5 h. The formulations are developed in this research work to overcome the first pass metabolism as the sublingual tablets bypasses the first pass metabolism. Sublingual tablets are prepared by using various super disintegrants as presented in Table 1 to compare the performance of quicker solubility in combination and alone. The concentration of the super disintegrants also varied to analyse the effect of the same. The various well established study reports described that the sublingual administration of drug enters directly in to the blood stream through the ventral surface of the tongue and floor of the mouth. The dissolved drug was quickly absorbed into the reticulated vein which lies beneath the oral mucosa. The drug is transported through the facial veins, internal jugular vein, and brachiocephalic vein and channelized to the systemic circulation. The prime mechanism involved in the drug absorption through sublingual route is passive diffusion through the lipoidal membrane. The main advantage of absorption of the drug by means of the sublingual route is 3 to 10 times greater than oral route. And sublingual dosage from requires a very small volume of saliva for the disintegration of the tablet. The guidelines say that even a wet hand may disintegrate the tablet so that the patient has to use it with a dry hand. Sublingual absorption is quicker but the duration is short that is not a big issue in mild and moderate conditions of nausea and vomiting. In terms of permeability, the sublingual area of the oral cavity is more permeable than the buccal, palatal area. The permeability may be affected by relative thickness, the blood supply, and degree of keratinization of these membranes. The mild moderate nausea and vomiting and the same is due to GI infections 4 mg is sufficient in case of higher dose needed in rare cases it can be recommended for two times a day. In conditions such a cancer, cancer chemotherapy higher doses are recommended starting from 4 mg to 24 mg. As the objective of this research is to deliver the quicker onset of action and rapid therapeutic effect 4 mg is the basic dose chosen in the formulation design. The ondansetron dose for oral dosage form for the prevention of moderate nausea and vomiting after treatment with cancer medicines is briefly described. Adults, teenagers, and children 12 years of age-at first, one 8 mg dose taken 30 minutes before starting cancer treatment. The second 8 mg dose is taken 8 hours after the first dose. Then, one 8 mg dose is taken two times a day (every 12 hours) for 1-2 days. Children 4-11 years of age at first, one 4 mg film taken 30 minutes before starting cancer treatment. The second and third 4 mg films are taken 4 and 8 hours after the first dose. Then, one 4 mg film is taken three times a day (every 8 hours) for 1-2 days. The ingredients were studied for their physicochemical compatibility with the drug Ondansetron. The physical mixture of the drug was analysed by FTIR (Shimadzu) in the wavelength range of 400-4000 cm-1. The spectrum obtained from FTIR revealed that the pure drug demonstrated the peaks at 2850.88 cm-1 for alkane C-H Stretching, 3144.07 cm-1 for aromatic C-H Stretching, the peak at 1280.78 cm-1 demonstrated cyclohexanone group. A physical mixture of the drug with excipients also demonstrated the characteristic peaks at range 2850.88 cm-1, 3146.00 cm-1 and 128.76 cm-1 due to the respective functional groups which demonstrated that there was no interaction between the drug and used ingredients. This was confirmed by studying the drug and used excipients in differential scanning calorimetry (DSC) thermo grams (Figures 1-6). Figure 1: FT-IR Spectrum of Ondansetron. Figure 2: FT-IR Spectrum of Ondansetron and starch citrate. 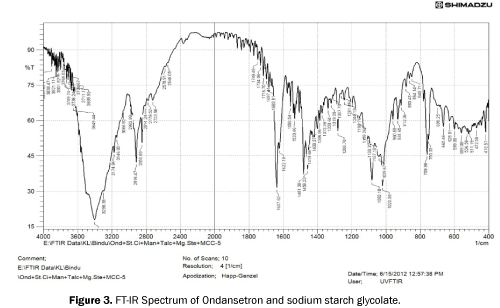 Figure 3: FT-IR Spectrum of Ondansetron and sodium starch glycolate. Figure 4: FT-IR Spectrum of Ondansetron and cross carmellose sodium. Figure 5: FT-IR Spectrum of Ondansetron and starch citrate with other excipients. 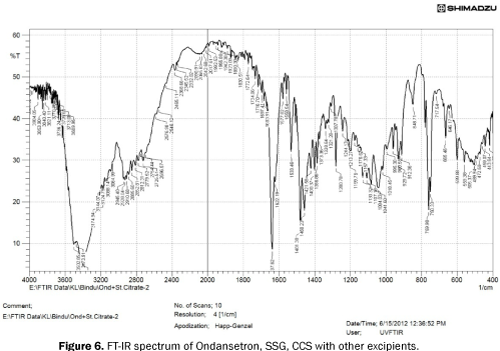 Figure 6: FT-IR spectrum of Ondansetron, SSG, CCS with other excipients. 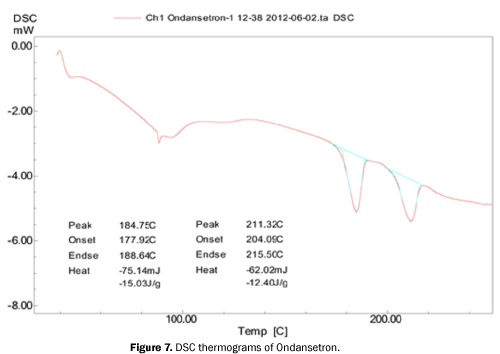 DSC Spectrum of Ondansetron pure drug demonstrated a characteristic sharp endothermic peak at 184.75°C. 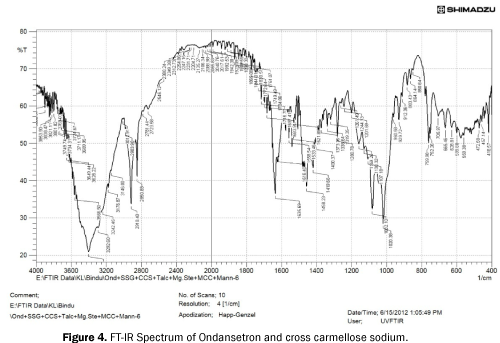 DSC spectrum of ondansetron with cross carmellose sodium demonstrated a characteristic sharp endothermic peak at 180.79°C. Similarly, ondansetron with sodium starch glycolate demonstrated a characteristic endothermic peak at 174.88°C. The Starch citrate physical mixture showed at 185.9°C which is a bit higher than the characteristic peak value of Ondansetron alone which is 184.75°C. But there was no specific shift in the thermal behaviour. The overall reports of DSC spectrum revealed that the deviation was minimized in the thermal behaviour of the drug in the presence of other ingredients which confirmed the compatibility of the used ingredients with the pure drug (Figures 7 and 8). 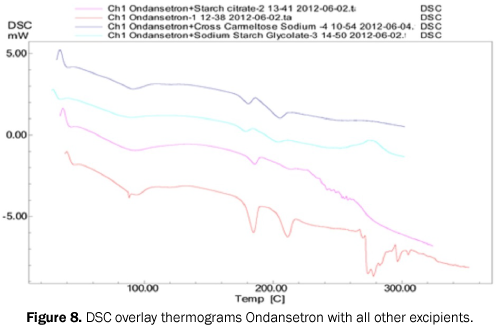 Figure 7: DSC thermograms of Ondansetron. Figure 8: DSC overlay thermograms Ondansetron with all other excipients. The pre-compression parameters such as Angle of repose, Bulk density, Compressibility index, Tapped density and Hausner’s ratio were evaluated and found to be in a satisfactory range before the compression of the prepared powder. The angle of repose of the prepared powder was ranged between 28.10-30.86 for F1 -F13 which demonstrated the good flow properties. The detailed values of pre-compression parameters were depicted in Table 2. Table 2: Superdisintegrants composition in formulation design. The prepared powder was directly compressed in a 16 station tablet compression machine (Cadmach) by using 8 mm punches the batch size of each formulation was 300 tablets for each group. After the compression, the tablets were evaluated for the quality control parameters. The prepared tablets were found to be good without any major tablet manufacturing defects. The surface of the tablet was found to be smooth and elegant. There was no sign of picking, sticking, and lamination, capping, chipping and cracking during the compression of the tablet. The prepared tablets were evaluated for post compression parameters such as thickness, weight variation, hardness, friability, content uniformity and wetting time (Table 3). The thickness of the tablet was made constant with minimum deviation by which the weight variation of the tablet was controlled within the limits. The hardness of all the formulations falls between the minimum of 2.50 Kg/cm2 and to the maximum of 2.80 kg/cm2. The friability was maintained as low as 0.2 to the maximum of 0.74 and the values were found to be within the limits. Since the tablet was meant for sublingual administration is subject to wetting time test by placing the tablet between two layers of absorbent paper. The time required for water to get absorbed from the paper to completely wet the tablet was noted using a stopwatch. Wetting time of tablets was ranged between 39 seconds to 85 seconds. The formulation F1 demonstrated the highest wetting time of 85 seconds and formulation F13 demonstrated the lowest wetting time of 39 seconds. The formulation F4, F6, F7, F8, F11 showed wetting time between 50-60 seconds. Formulations F1, F2, F3 showed wetting time between 70-85 seconds. Formulations F12, F10, F9, F13 showed least wetting time range of 39-50 seconds. Table 3: Flow properties of powders prepared by different techniques. The amount of the drug present in the formulations F1-F13 was found to be within the limits. The results were presented in Table 3. Tablets were also evaluated in disintegration time test since the quick disintegration is the prerequisite for the tablets meant for fast release of drugs. The formulations showed highest wetting time values also demonstrated more disintegration time. The formulation F1, F2, F3 and F5, demonstrated the highest disintegration time of 45-57 seconds. The formulation F3, F4, F6, showed moderate disintegration time of 38-40 seconds. The formulation F7-F13 showed lowest disintegration time between 28-37 seconds in the whole group. Disintegration time can be considered as an indicator for mouth dissolving property since the tablet was expected to disintegrate rapidly in the oral cavity and release the drug within a few seconds of the administration of the dosage form. Separate well-designed dissolution tests were carried out for all the formulations in triplicate. The dissolution study was carried out in 900 ml 0f 6.8 pH phosphate buffer was used. The samples were withdrawn at different time intervals and analysed spectrophotometrically against the blank. Every time the bath was replenished with fresh media to maintain the sink condition. The drug release profile of the formulation was analysed. The formulations F1-F4 were prepared with increasing concentrations of starch citrate (5%, 10%, 15%, 20%) respectively. The dissolution profile of F1-F4 was demonstrated that 97-98% of the drug was released from F1and F2 within 40 min of dissolution study in which F1 takes highest disintegration time of 57 seconds followed by F2 which disintegrated completely at 46 seconds. The formulation F3 and F4 released more than 95% of the drug within 25 min of dissolution study in which F4 have taken only 20 min for the maximum amount of drug release which also demonstrated the comparatively less disintegration time of 38 seconds. This formulation was prepared only with starch citrate as the super disintegrant. In this study, the effect of the second super disintegrant on the dissolution of the tablets were studied. For this purpose, the formulation which shows the less disintegration time and fast dissolution profile was chosen for the further study in combination with other super disintegrants. Among starch citrate based formulation F4 was found to be quicker in disintegration and faster in dissolution behaviour which contains 20% of starch citrate. Further, three more formulations were developed on F4 in combination with croscarmellose sodium. The formulations were termed as F11, F12 and F13. These formulations were containing 20% of starch citrate in each and 5%, 7.5% and 10% of croscarmellose sodium respectively. The formulations prepared with starch citrate and croscarmellose sodium were evaluated for their dissolution behaviour. The formulation F11 and F12 released a maximum amount of 96% within 8 minutes of dissolution study. In F13, the dissolution was much faster and 98% of the drug were released within 4 minutes of dissolution study, which also demonstrated the disintegration value of 28 seconds, which was found to be the optimized formulation with superior behaviour over any other formulations within the formulation design and also against the marketed formulations. In order to compare the dissolution behaviour of the optimized formulation F13 against the other super disintegrant based formulations (croscarmellose sodium and sodium starch glycolate) new formulations were developed in combination with both the super disintegrant. Formulations F5-F7 contain sodium starch glycolate in increasing proportions (10%, 15%, 20%) respectively, and croscarmellose sodium in constant level (5%). Whereas Formulations F8-F10 contains croscarmellose sodium in increasing proportions (10%, 15%, 20%) respectively, and sodium starch glycolate in constant level (5%). The dissolution studies were also performed on these formulations. Formulations F5 and F6 released the maximum amount of drug within 25-20 minutes of dissolution profile respectively, which also demonstrated the lowest value due to the dual effect of two super disintegrants. The formulations F8 and F9 released about 95% of the drug within 15-20 min of dissolution profile study respectively. The formulations F10 which contains highest proportions of croscarmellose sodium (20%) and (5%) of SSG respectively, and released 95% of the drug within 10min of the dissolution study. Among the formulations F1-F4, F4 was found to be the fastest in disintegration and drug release which last about 20 minutes. Among the formulation F5-F10, F7 and F10 were found to be fastest in disintegration and drug release, which took at least about 15 minutes and 10 minutes respectively. From the overall study, it was confirmed that the formulations based on starch citrate in combination with croscarmellose sodium (20% and 10%) released the drug at a faster rate with very less disintegration time. The other quality control parameters of the formulation were found to be excellent. Data's were represented in the respective tables (Table 4). Table 4: Quality control parameters of Ondansetron sublingual tablets. All the formulations in the formulation design were prepared with one or other super disintegrants such as starch citrate cross carmellose sodium and sodium starch glycolate. The formulations F1-F4 contains no other super disintegrants other than starch citrate. The formulations F5-F10 were prepared with the famous super disintegrants in combination that is CCS and SSG in various ratios. The best formulation from the F1-F4 was selected based on the dissolution profile and other formulation characteristics were prepared in combination cross carmellose sodium in the various ratios as per Table 2. The dissolution profile of the formulations containing starch citrate alone was found to be the highest but even it was more or equal to the formulation containing both known super disintegrants in combination (CCS: SSG). When starch citrate is replaced by SSG the dissolution profile was dramatically changed and those formulations released the entire content of the drug in the shortest period as compared to other formulations. Starch citrate can be used as a directly compressible vehicle and starch citrate can be used as a carrier in the solid dispersion to enhance the dissolution. It is known to have ion-exchange properties as well as swelling properties based these characteristics in this research work. Starch citrate was used as super disintegrant as well as the directly compressible material. The compressibility index and Hausner’s ratio of starch citrate containing formulations F1-F4 and F11-F13 were found to be good. The wetting time and disintegration time of these formulations were found to be the lowest among all the other formulation prepared without starch citrate. The formulation F1-F4 demonstrated the moderate disintegration time when prepared along with starch citrate, but it was dramatically decreased when it was in the combination with other super disintegrants. The wetting time also demonstrates the same as both disintegration time and wetting time-related factors which impact each other. This may be due to the potential properties of starch citrate of one or other such as swelling, gelation, and water holding capacity, foam capacity and emulsion capacity . As discussed the potential of in vivo also confirmed the superiority of starch citrate in combination with other ingredients confirmed the potential of starch citrate as an ingredient in Fast disintegrating or dissolving tablets [13,14] (Figures 9-12). 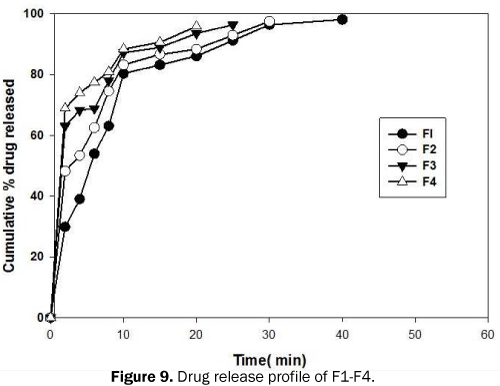 Figure 9: Drug release profile of F1-F4. 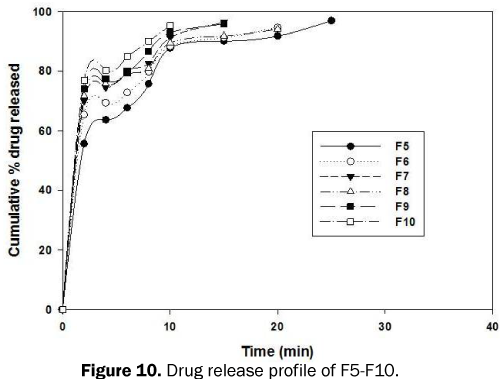 Figure 10: Drug release profile of F5-F10. 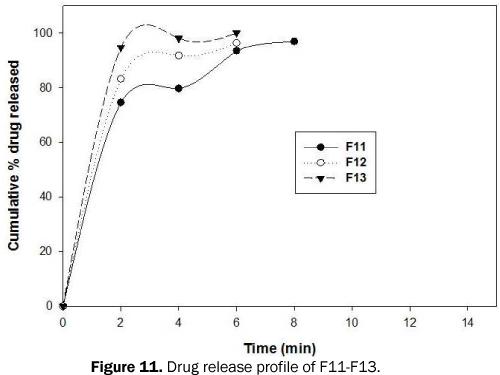 Figure 11: Drug release profile of F11-F13. 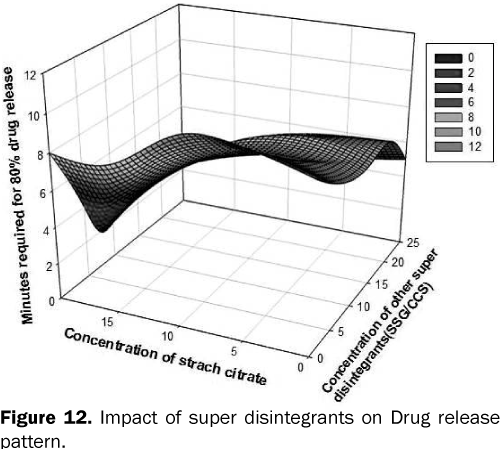 Figure 12: Impact of super disintegrants on Drug release pattern. The kinetics of the drug release was studied by fitting the dissolution data with various pharmacokinetic models such as zero order, first order, Korsmeyer-peppas and Higuchi. The data was best fitted with the first order. Release model was confirmed by considering the r2 values. The first order rate constant value falls between 0.09-0.5 hr-1.The results of drug release kinetics also revealed that the formulation can be successfully prepared as immediate release formulation and can be used after the proper bio studies (Table 5). Table 5: Rate constants and release kinetics of Ondansetron. The purpose of stability testing is to provide evidence on how the quality of a drug substance or drug product varies with time under the influence of a variety of environmental factors such as temperature, humidity and light and enables recommended storage conditions, re-test periods and shelf lives to be established. Stability studies for the developed formulations were carried out by storing the selected formulations at 25°-30° ± 20 and 40°C ± 2 with 75% RH up to 90 days. The formulations F13 selected on the basis of their results of in vitro disintegration time and high cumulative percentage drug release. These formulations showed no significant changes in the values. The data obtained are tabulated in Table 6. From the obtained data of tablet evaluation parameters indicated that stable formulations can be developed using direct compression method. Table 6: Stability parameters of formulation F4 and F9 stored at room temperature. The Ondansetron sublingual tablets were prepared successfully by using starch citrate as super disintegrant. The formulations were successfully prepared without any manufacturing defects. The study results revealed that the formula can be suitable to prepare the tablets by direct compression and starch citrate also offered excellent flow properties and the compression of the tablets were successfully done. The significant role of starch citrate in the formulation, disintegration time, dissolution, wetting time, confirmed the suitability of starch citrate as the super disintegrant. The study also revealed that the fast disintegration and dissolution was better in combination rather than using the starch citrate alone. The short term stability studies confirmed the stability of the product, however long term stability studies were recommended. The properties such as ion-exchange, swelling, solubility, emulsifying property, flow and compression properties of the starch citrate explored it as an excellent ingredient for immediate release dosage forms. Birudaraj R, et al. Buccal permeation of buspirone: Mechanistic studies on transport pathways. J Pharm Sci. 2005;94:70-78. Ishikawa T, et al. Pharmacokinetics of acetaminophen from rapidly disintegrating compressed tablet prepared using microcrystalline cellulose (PH-M-06) and spherical sugar granules. Chem Pharm Bull. 2001;49:230-232. Susanne B, et al. In vitro and in vivo evaluation of a new sublingual tablet system for rapid Oro mucosal absorption using fentanyl citrate as the active substance. European J Pharm Sc. 2003;20: 327-334. Nibha KP and Pancholi SS. An Overview on: Sublingual Route for Systemic Drug Delivery. Int J Res Pharm Biomed Sc. 2012;3:913-923. Noushin B, et al. Formulation and Optimization of Captopril Sublingual Tablet Using D-Optimal Design. Iranian J Pharm Res. 2008;7:259-267. Zhu Y, et al. Pharmacokinetics and bioavailability study of two ondansetron oral soluble film formulations in fasting healthy male Chinese volunteers. Drug Des Devel Ther. 2015;12;9:4621-4629. Patel P, et al. Sublingual route for the systemic delivery of Ondansetron. Int J Drug Dev Res. 2011;3:36-44. Omaima A, et al. Formulation and optimization of Mouth dissolve tablets of Rofecoxib solid dispersion. AAPS Pharm Sci Tech. 2006;7(2):55. Vikesh shukla, et al. Effect of different Super disintegration on release behaviour of Rifampicin dispersible Tablet for oral treatment of Tuberculosis. Int. J Pharm. Sci. 2010;2(3):871-83. Wepner B, et al. Citrate starch- application as resistant starch in different food systems. Starch, 1999;51:354-361. Wing R. Starch citrate: preparation and ion exchange properties. Starch. 1996;48(7)275-279.